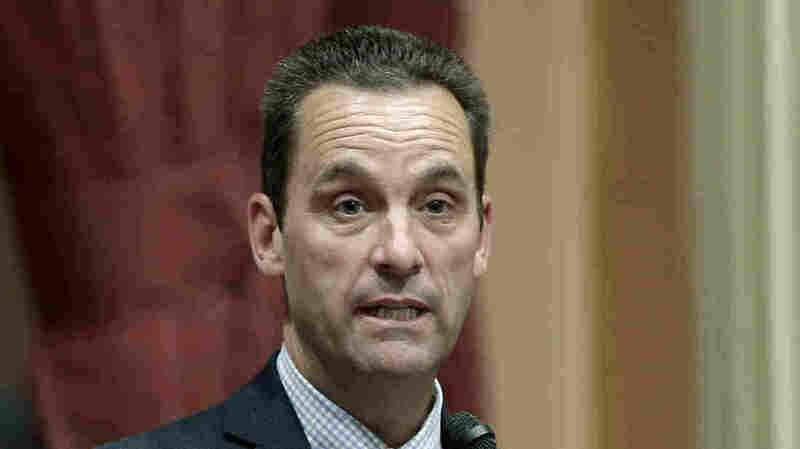 House Split On Immigration Might Be Good Politics For Some Moderate Republicans California Republican Rep. Steve Knight is pushing for a vote on bipartisan immigration legislation. This puts him at odds with GOP leadership in the House during an election year. In this May 28, 2014, file photo, then-California state Sen. Steve Knight, R-Palmdale, speaks at the Capitol in Sacramento, Calif.
That plan frustrates House leaders who worry a messy fight on immigration will divide the party and boost Democrats' chances of winning control of the House in November. But Knight said Monday in an interview at a Memorial Day event in his home district that he is confident that it's better for him if they at least try to pass some immigration legislation. "This is doing probably one of the hardest things in America that we've ever tried to do," Knight said. "I understand that, but I think we have the votes to get something done." Knight said the best path forward is a bill to combine some measures for increased border security with legal protections for the roughly 800,000 people who stand to lose protections under Deferred Action for Childhood Arrivals program, or DACA. He said he's heard from voters in his district and he's confident that is what they want. "People have said that consistently," Knight said. "If I just don't listen then I'm not listening to the people in my district." That position puts him at odds with many in his party, including House conservatives and President Trump. Trump continues to lean into the same hard-line position on immigration that was his signature in 2016 — he wants a wall along the border with Mexico and broad crackdowns on illegal immigration. He told a crowd in Tennessee Tuesday night that Republicans need to be tough if they want to win. "And you can say what you want, but I think border security and security in general is a great issue for the Republican Party," Trump said. "I think it's a great issue. Not a bad issue." But Democrats and many moderates disagree. They say a majority of Americans oppose a wall, and point to polls like a recent ABC News/Washington Post survey that showed 86 percent of voters support the DACA program. The issue is even more personal in California, a state that is home to nearly 30 percent of all DACA recipients. That's part of why Knight is willing to risk angering party leaders. He represents one of the 23 districts that voted for Hillary Clinton in 2016 but voted for a Republican for Congress. Democrats believe Republicans are unpopular across the country and particularly here, in part because of issues like immigration. But Democrats here haven't figured out the right way to campaign against a Republican like Knight. With less than a week to go before their June 5 primary, the two top Democrats are at odds over whether they should court progressives or stick to more moderate policies that could help them win votes from a wider range of voters. In California's system, all candidates — regardless of party — compete in the primary and the two top vote-getters advance to the general election in the fall. Bryan Caforio is the most progressive of the Democrats running here and he says Knight's rogue move signing the immigration petition won't be enough to set him apart. "It's a huge issue and frankly Steve Knight isn't doing anything on it," Caforio said while knocking on doors in the high desert city of Palmdale. "Signing a discharge petition, that probably won't go through when four bills will be put up anyway, some of which are horrible, is nothing but trying to confuse people into thinking he cares." His opponent Katie Hill takes a more moderate approach. She's in line with party leaders in Washington who want to trade some border security money for DACA protections. She argues its the right way to win votes in this moderate suburban district. "We are going to have to make sure that we've got the best possible chance of defeating him in the fall," Hill said in an interview at a canvassing kickoff last weekend in Simi Valley. The two Democrats are at odds over more than just immigration in a race that has grown increasingly tense in recent weeks. Hill insists that her moderate approach is the only way Democrats stand a chance of beating Knight in November. Recent analysis from The Cook Political Report ranked the seat as a toss-up that could trend more favorably for Democrats if she wins in the primary. But, Knight says he isn't worried about facing one of them in November. "This district has never flipped," Knight said. The California Republican is confident that his position on immigration is right for his district. He said he knows immigration is a tough issue for Republicans but he says its not for him. Plus, he says, voters have a lot more on their minds than just immigration. "We got into Congress to work on military, veterans and small business," Knight said. "That's what we've done. They know that. The veterans know that. We've kept our word." Bert Brionies, a Democrat here, agrees. He says he respects that Knight took his own route on immigration. Plus, he likes Knight's work on local issues. Briones knows Democrats need to defeat Republicans like Knight to win control of the House. But, he trusts his congressman and he's planning to vote for him in November. "I'm more in favor of Knight. He's been in office longer," he said. "I'd like to stay with the Democrats but if I see that someone has ideas that would favor my way of thinking then yea, I'd sway towards that." Knight's split on immigration may infuriate Republican leaders but it could be the key to helping the GOP keep their House majority.